Helmut Oberlander is 94 years old and resides in Waterloo (Ontario) after a career in real estate. He was born in 1924 in the city of Halbstadt (Ukraine) and arrived in Canada in 1954. Six years later, he became Canadian. For the fourth time, the Government of this country tries to annul his citizenship. Ronald Poulton, a lawyer for Oberlander, appeared before a federal appeals court in early May to request that his client do not lose Canadian citizenship. He argued that Oberlander could not go because of health problems. He testified before the judges that the nonagenarian has memory difficulties that prevent him from answering questions about his past. "The courts have established time and again that he did not participate in criminal activities," Poulton told CTV News. He also assured that Orlander was 17 years old when he joined the Nazi unit and that he was forced to do so, where he fulfilled non-violent tasks, especially as a translator. The fact is that Orlander remained silent about his links with the Nazis when he arrived in Canada and at the time of becoming a citizen. The Canadian government has annulled its citizenship four times since 1995; the last one in July of 2017. However, the first three decisions were revoked - under the argument that Oberlander belonged to the Nazi unit under pressure - and in a few weeks it will be known if the fourth attempt will prosper. If the answer is positive, the Border Services Agency of Canada has indicated that Oberlander will be deported to his native country or to another. Oberlander appears on the list of the most wanted Nazi criminals of the Simon Wiesenthal Center. This same institution has requested for several years to the German authorities to open a process against him. The Canadian Ministry of Justice reported that the Oberlander case is the only one still open about atrocities committed during World War II. Since 1980, 1850 cases have been investigated. In about thirty, judicial files were opened, four people faced criminal charges, while another one was deported. "This shows a huge effort in which the Canadian authorities have acted with determination to take all possible measures," Terry Beitner, director of the ministry's section on crimes against humanity, told Radio-Canada. However, Jewish groups - inside and outside of Canada - have indicated that the US has been lax in this matter for decades. In May 2015, Vladimir Katriuk, a former member of an SS battalion who died and never appeared before a judge, died at the age of 93 in Ormstown, Quebec. On the other hand, the Canadian judicial system rejected in 2009 a request to withdraw the citizenship of Wasyl Odynsky, who was a guard at the concentration camp in Trawinki (Poland). Odynsky passed away in 2014 in Scarborough (Ontario) at the age of 90. 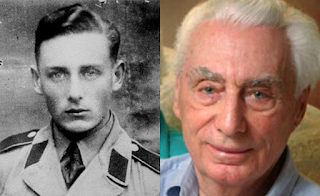 It remains to be seen what future awaits Helmut Oberlander.